Should we preach like a TED talk? TED is a phenomenon. There are now thousands of short talks by world experts available on the TED website, and because so many of them are captivating and memorable, people are asking ‘How can I speak as persuasively as a TED speaker’? And ‘How can I preach like a TED speaker?’ Because if you see the tagline, ‘Ideas worth spreading’, you’ll think, ‘But we have the best idea worth spreading that there is!’ And you’re right. Then we think of the attractiveness, audience pulling power, of a TED speaker, and we begin to dream. For preachers, there will always be a prior question, though. ’Should I speak as persuasively as a TED speaker?’ Because at the back of our minds is, or should be, Paul’s devastating critique of rhetoric in 2 Corinthians, which although it is arguably the most rhetorically sophisticated of his letters, is stinging in its attack on people who want to be impressive. And TED speakers aim to be impressive. 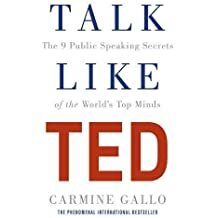 Carmine Gallo has written, ‘Talk like TED: The 9 Public Speaking Secrets of the World’s Top Minds’ (Macmillan, 2014), in which he aims to lay bare the communication lessons of these astonishing lectures in Technology, Education and Design (the TED elements). He did the same work a few years ago on Steve Jobs’ presentation style. He distills the lessons, and illustrates from the best of the TED talks (although he misses my personal favourite, ‘Leading Like the Great Conductors’ by Itay Talgam). Gallo backs the rationale for the nine findings by way of scientific research on the chemistry of the brain. Unleash the master within. Engage the subject you’re speaking about with passion because passion is contagious. Stay in your lane. Be open and authentic, yourself, because people can’t trust a phoney. First, a couple of quick headline cheers, and a headline boo. Cheer the ideas of being passionate (#1) and authentic (#9). If we aren’t excited by the gospel, we’re in the wrong job, and if we’re wearing a mask about it, ditto. Preachers above all people should be ahead of the game in this. And cheer the idea of storytelling (#2). Not for the manipulative reasons Gallo gives, but because so much of scripture is in story form, that only if we are good storytellers can we understand how their tension and release work. And only then can we preach on them without ruining a good story. Boo the idea of practice (#3). What’s being described here is either a single presentation that is once-in-a-lifetime, or one that is repeated and therefore to be rehearsed. If we are turning out a talk or two every week, there is simply no time to do this, even if we should. And there’s the rub, ‘even if we should’. Because so much of what is here falls into ideas of presentation that are not what preachers should aim at – or should aim at differently. The fundamental difference is that preachers trust the Word to do the work. I don’t have to deliver jaw-dropping moments – the gospel does that. I don’t have to strive for effect or impact, or stake everything on being so outstandingly memorable that everything else in the week seems bland. The gospel does its work, and it does it through the authentic weakness of the preacher. So much of Gallo’s book is about being impressive and memorable, it’s important for us to clarify that we steer in the opposite direction. Now don’t hear me wrongly. We shouldn’t strive to be boring, unmemorable, humourless and long! I have been challenged deeply by the best of these presenters, to be gripping and clear. But our speaking is in the service of a much greater cause, and for the honour of a Master who is jealous for his reputation, not ours. Sometimes we may well sound like a TED talk. At its most benign, any of these nine elements might simply be common sense These may simply be the contemporary marks of good style, in the way previous generations quoted Latin. Principles like ‘The Rule of Three’ are story telling lessons as old as the hills, and to be found in the pages of scripture too. But cultural values are never sinless, and need to be corrected in the light of the gospel. Preach persuasive, engaging sermons. So never confuse style with substance, never lose sight of the logic of the gospel, and never lose trust in the Word do its work. Really helpful post Chris, thanks. It would be possible to overstate this, wouldn’t it? The gospel is the jaw-dropping surprise in every story it impacts. The gospel is so memorable that everything else seems bland. So our sermons can be like that – provided it’s the gospel that is making the impact / impression / surprises. Could we even go one step further, and say that unless our preaching is doing that, it’s not the gospel we preach. At which point those negative points are only negatives if we use these as empty rhetorical devices to grab people’s attention almost deceitfully. Subservient to allowing the gospel to speak, they are the word doing it’s work (not alternatives to letting the word do its work). Related point: At some point I’d love to know what you think of Lowry’s “Homiletical Plot”. Of course you’re right – my worry about the Gallo material is that it shows that TED speakers are among at disarming the audience’s critical faculties by (and for) rhetorical effect. That should be beneath us, even if it is superficially attractive because it works! It is the logic of the gospel which moves and surprises. I’ll come back to Lowry at some point. The TED talk phenomenon has snowballed since the very first talk in 1984. With its slogan “ideas worth sharing”, TED has arguably even created its own genre, that of entertainment-through-inspiration. Short, punchy, often emotionally moving presentations, they’re meant to leave you with a fire in your belly and scales fallen from your eyes. And so understandably they’ve got the attention of those who are regularly involved in preaching. On the one hand some seem very critical, dismissing the suggestion that the Christian preacher could learn anything from a phenomenon outside the church. On the other hand some appear intent to overhaul the seminary textbook and treat TED as the best thing since sliced bread, or at least since the Powerpoint pulpit frenzy of the 90’s.